The Hebrew word 'kinah,' referenced in the Shekinah pillar, means 'purple.' Thus, the Shekinah literally means 'she-purple.' The Biblical land of Canaan has the same 'kinah' etymology, making it the 'land of purple.' As a result, the merchants that came from Canaan were called the purple merchants and even traded in a powdered purple pigment. It is important to know that Canaan was the region that included Israel, Lebanon, Jordan, Syria and northeastern Egypt, which would include Giza. Thus, we find that the Shekinah pillar (also referred to as a pole or tree) was a unifying symbol for all of the feminine deities in this region from Babylonian Ishtar to the Egyptian goddess Isis and her Ankh. At the same time, many of the feminine gods in Canaan were associated with the planet Venus. This included Ishtar and Isis, but also Astarte, Inanna, Semiramis, Lilith, Ashtoreth or Asherah. Later, this migrated out of Canaan to become Demeter, Hathor, Kali, Ostara, Eastre, Aphrodite and the Roman Venus, from which the planet is named. Some believe that all of these goddesses originated in India as Vena and that all religions therefore must have originated in the Indus Valley near Tibet. The words Vena, Veda and Venus do share a common etymology. In the Hebrew Kabbalah, there is a story where the goddess Lilith is transformed into a Shekinah pillar, also called the Asherah pole after the goddess Asherah. In this fable we find that the Shekinah pillar is also a symbol for the planet Venus, combining with another symbolic geometry for Venus, the pentagram. This symbol originates in the astronomical fact that Venus aligns with the Earth five times over an 8-year period, thus tracing a pentagonal rose in the night sky (i.e., the Star of Bethlehem). This is an important point, since the intersections of a pentagram form a golden ratio of about 1.618 (called the divine proportion), very close to the orbital resonance of Venus to Earth at 13:8 = 1.625 (the difference is John Dee's secret number .007). In Rosslyn, the Shekinah pillar has pentagram stars carved into the top, confirming this association. Figure 1. 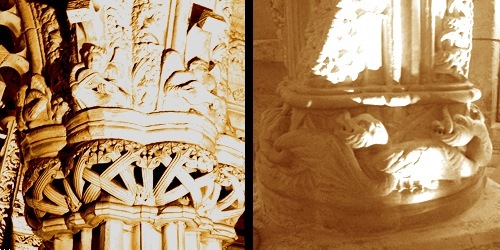 Pentagonal Venus stars, musical cherubs and dragon-serpents in the pillars at Rosslyn. Wrapped around the Asherah / Shekinah pole we often find serpent symbols, as in the medical Caduceus and Staff of Moses. In this way, the Shekinah corresponds to the 'world axis' of Mount Meru in Vedic mythology symbolizing the Fibonacci spiral winding around the golden ratio (Pingala, Art of Prosody in 450-200 BC). The Vedas explain that there is gold hidden inside the World Mountain of Meru and that it is protected by the goddess Vena together with Shukra (the planet Venus) and the Asura, serpent deities that live inside the mountain. Clearly, Vedic Mount Meru and the Hebrew Shekinah represent the very same thing and that is the golden ratio in the orbit of Venus. Now, the color purple happens to be a very special color in the Shekinah symbolism because it is the only color that does not exist in the visible color spectrum. It is actually a synesthetic blend of magenta and violet that psychologically fills the invisible void just outside of human visual perception. Purple is how our mind mends the spiraling visible light spectrum into a closed color wheel. In this way, purple transcends the physical, symbolizing divinity and royalty. Jesus was said to have been clothed in a purple robe before crucifixion, as were the Meruvingian kings and many other kings and priests before and after. Another name for the people from Canaan was Phoenician, which also means purple. This term originated in a variation of the word Phoenix, a name for the plumed flying serpent (the female counterpart to the male dragon) who laid the Cosmic Egg containing its own ashes (poor Asherah, the Asura). We all know the story of the Phoenix firebird rising up from the ashes. 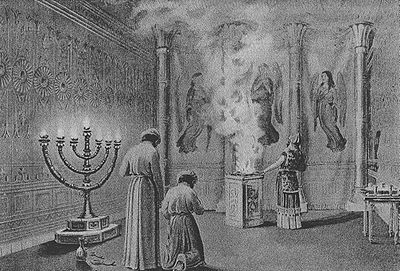 Is it a coincidence that the Shekinah feminine presence is described in the Hebrew Torah as a pillar of smoke and so represented in the Temple of Jerusalem? Figure 2. The Hebrew Shekinah in the Temple of Jerusalem. Figure 3. The Shekinah purple ratio in the Rosslyn Chapel Floor Plan. The importance of the purple ratio is thus two-fold. First, the founding principle behind early religion was fertility, especially as it pertained to transcendental resurrection or reincarnation. For this reason, the feminine life-giving aspect of God was the foundation of early religion, providing a self-organizing principle for early social development. Nowadays, all we have left of the sacred feminine is the Mother Mary icon, a distant etymological equivalent to the Vedic word Meru. The second thing we find in the purple ratio is evidence of an ancient harmonic science driving the development of spiritual symbolism and ritual. After all, the purple ratio has a real physical damping effect on harmonic resonance. And it can be argued that this damping action in the sun's plasma disc is what spaced the planets along a spiral while later guiding evolution toward Fibonacci proportioned bodies around a serpentine spine. The historical use of purple to describe Canaan, the Shekinah and in sacred clothing is undeniable proof that religion was once founded on a deep knowledge of harmonic physics. As ancient philosopher priests seemed to know, there is a musica universalis to be found inside our own minds. This is the purple ratio of coherence and order universal to all things. Led by an ancient spiritual science of harmony, people once gathered around the symbols of a winged serpent, world mountain, golden egg and heavenly star, singing together for eternal renewal through a transcendental pillar of purple light.